The LG G3 is a new flagship device while the Apple iPhone 5S released last year. Both of these phones have plenty to offer, but any decision between them may be decided by many people on the operating platforms, as the G3 is an Android device while the iPhone 5S runs iOS. 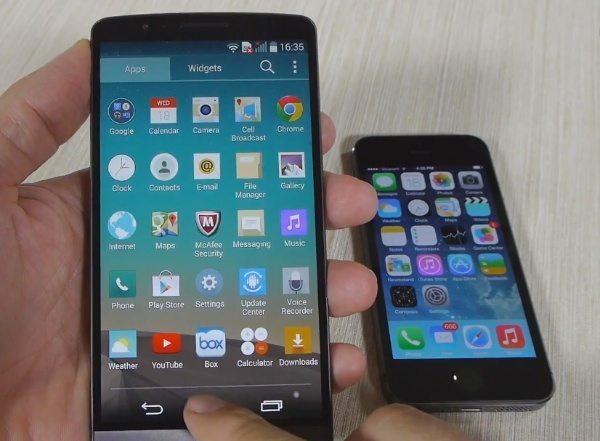 If you have an open mind regarding operating systems, you might find this comparison of the LG G3 vs. iPhone 5S useful. We’ve previously shown a video showing a concise comparison of the LG G3 and iPhone 5S that concentrated on the strongest points of each. However, this latest video look offers a fuller comparison and a chance to get a really good look at these two phones. The YouTube video that you will see below this article comes from Phone Arena and covers virtually ever aspect that you can think of. It begins with showing the designs of the phones and discussing the builds before moving on to factors such as the displays, user interfaces and software, processors and performance, and browser experience. After these aspects the comparison continues by looking at music players and then cameras (including sample images). At the conclusion of the video the reviewer sums up some of the swings and roundabouts for the LG G3 and iPhone 5S, with both having benefits over the other in particular aspects. We’ll let you check out the video for yourselves to get the full picture. If you wish to read more about these phones you can do so at these LG G3 and iPhone 5S links. Once you’ve watched the video comparison below it would be good to hear which one you find most appealing. Will it be the LG G3 or the iPhone 5S, or maybe you want to wait until later this year to see what the iPhone 6 brings to the table?